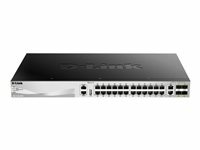 D-Link Layer 3 Switches operate at the network layer and use both MAC and IP addresses to communicate with the rest of the network. The universally accepted IP protocol allows for large-sized networks that can grow virtually limitless and offers advanced features for extra flexibility. The all-new DGS-3130 Series Gigabit Layer 3 Stackable Managed Switches are designed to address the needs of small to medium-sized business networks. A unified software image incorporates L2 and L3 features enabling the family to be deployed in a variety of environments and topologies. Together the hardware and software enhancements combine to create a family of powerful, flexible and cost-effective switches. The DGS-3130-30TS switch has 24 gigabit ports with six embedded 10G uplink/stacking ports. Two 10GBASE-T ports and four 10G SFP+ ports. 2 x 10GBASE-T, 4x SFP+ 10G ports Physical Stacking Layer 2 Features Layer 3 Features Connect to areas of your network at 10G speeds, and reach even further distances with fibre optic cabling. Up to 9 units per stack1, with a maximum of 324 ports, and up to 80GB of bandwidth. Such as flow control, link aggregation, Ethernet Ring Protection Switching (ERPS), Spanning Tree Protocols, Loopback Detection, IGMP/MLD Snooping. Including up to 16 IP Interfaces, IGMP Filtering, Neighbor Discovery Protocol (ND), ARP Proxy, VRRP. RIPv1/v2/ng Static Routing Industry Standard CLI Dual Image Determines the best route to a destination in the network. Route Layer 3 traffic between switches, even if they're segmented in VLANs. Supports a full industry standard Command-Line Interface for system management. Risk-free configuration testing. Greater port density. Powerful Layer 3 features. Advanced L2 and L3 features including port security, Storm Control, Spanning Tree Protocols, IGMP/MLD Snooping, and IPv6 ND. Management options like a multilingual web-UI, and industry standard CLI support, with support for multiple images and multiple configurations. 6x 10-Gigabit ports, physical stacking for more ports, and they have built-in G.8032 Ethernet Ring Protection Switching (ERPS) to help minimise recovery times to 50 ms. An USB 2.0 interface to store config files, boot images, and syslog. As well as support for an additional external redundant power supply on all models to ensure maximum uptime. Includes the latest security such as Multi-layer and Packet Content Access Control Lists (ACL), and Storm Control. And our exclusive D-Link Safeguard Engine has been designed to guard against traffic flooding caused by malicious attacks and protect your business network uptime. IP-MAC-Port Binding allows you to bind a source IP address with an associated MAC and define the port number to enhance user access control. And DHCP Snooping makes the switch learn IP/MAC pairs by snooping DHCP packets and saving them to the IMPB whitelist, giving you extra control. They feature multiple authentication mechanisms such as 802.1X, Web-based Access Control (WAC), and MAC-based Access Control (MAC) for strict access control and an easy deployment. After authentication, individual policies such as VLAN membership, Quality of Service (QoS) policies, and ACL rules can be assigned to each host. Support for the Microsoft® NAP policy enforcement allows you to protect network assets from compromised computers by enforcing compliance with network health policies. A rich set of multi-layer QoS/CoS features ensure that critical network services such as VoIP, video conferences, IPTV, and IP surveillance are always given high priority, and 10-Gigabit ports deliver the speed you need. Traffic Shaping features guarantee bandwidth for these services even when the network is busy. L2 Multicast support enables the DGS-3130 Series to handle growing IPTV applications. Host-based IGMP/MLD Snooping allows multiple multicast subscribers per physical interface while ISM VLAN allows the switches to send multicast streams in a multicast VLAN to save bandwidth, and to provide better security to the backbone network. The ISM VLAN profiles allow you to bind or replace the pre-defined multicast registration information to subscriber ports quickly and easily. Selective Q-in-Q enables you to be selective over VLAN traffic. 1 When stacking the DGS-3130-30TS/30S/30PS models, the stacking cost is 1 per unit so the maximum units per stack is 9. When stacking the DGS-3130-54TS/54S/54PS models, the stacking cost is 2 per unit so the maximum units per stack is 6. When stacking different models in the same stack, switches can be stacked up to a maximum of 12 stacking cost per stack. For example: 2 x DGS-3130-30TS (2 stacking cost) + 2 x DGS-3130-30S (2 stacking cost) + 4 x DGS-3130-54TS (8 stacking cost) consumes a total stacking cost of 12 (2+2+8). The DGS-3130-30S switch has 24 gigabit SFP ports with six embedded 10G uplink/stacking ports. Two 10GBASE-T ports and four 10G SFP+ ports. 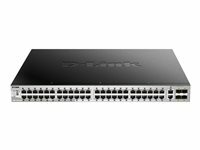 The DGS-3130-30PS switch has 24 PoE+ gigabit ports with six embedded 10G uplink/stacking ports. Two 10GBASE-T ports and four 10G SFP+ ports. The DGS-3130-30PS has a 370W PoE power budget. Or utilise a total of 740W when adding a redundant power supply. The DGS-3130-54TS switch has 48 gigabit ports with six embedded 10G uplink/stacking ports. Two 10GBASE-T ports and four 10G SFP+ ports. The DGS-3130-54S switch has 48 gigabit SFP ports with six embedded 10G uplink/stacking ports. Two 10GBASE-T ports and four 10G SFP+ ports. Enhanced network reliability The DGS-3130 Series targets enterprises and metro Ethernet applications, and customers who require a high level of network security and maximum uptime. The DGS-3130 Series supports an external redundant power supply to ensure continued operation. The models also include reliability features, such as 802.1D Spanning Tree (STP), 802.1w Rapid Spanning Tree (RSTP), and 802.1s Multiple Spanning Tree (MSTP), Loopback Detection (LBD), and Broadcast Storm Control, that enhances network resilience. Comprehensive security The DGS-3130 Series provides users with the latest security features such as Multi-layer and Packet Content Access Control Lists (ACL), Storm Control, and IP-MAC-Port Binding (IMPB) with DHCP Snooping. The IP-MAC-Port Binding feature allows administrators to bind a source IP address with an associated MAC and also define the port number to enhance user access control. With the DHCP Snooping feature, the switch automatically learns IP/MAC pairs by snooping DHCP packets and saving them to the IMPB white list. Easy access control policies The DGS-3130 Series supports authentication mechanisms such as 802.1X, Web-based Access Control (WAC), and MAC-based Access Control (MAC) for strict access control and easy deployment. After authentication, individual policies such as VLAN membership, QoS policies, and ACL rules can be assigned to each host. In addition, the switch also supports MicrosoftВ NAP (Network AccessProtection). NAP is a policy enforcement technology that allows customers to protect network assets from compromised computers by enforcing compliance with network health policies. Versatile traffic management The DGS-3130 Series implements a rich set of multilayer QoS/CoS features to ensure that critical network services such as VoIP, video conferencing, IPTV, and IP surveillance are given high priority. Traffic Shaping features guarantee bandwidth for these services when the network is busy. L2 Multicast support enables the DGS-3130 Series to handle growing IPTV applications. Host-based IGMP/MLD Snooping allows multiple multicast subscribers per physical interface and ISM VLAN to send multicast streams in a multicast VLAN to save bandwidth and to provide better security to the backbone network. The ISM VLAN profiles allow users to bind/replace the pre-defined multicast registration information to subscriber ports quickly and easily. The DGS-3130-54PS switch has 48 PoE+ gigabit ports with six embedded 10G uplink/stacking ports. Two 10GBASE-T ports and four 10G SFP+ ports. 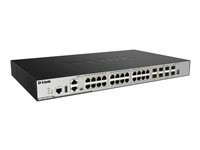 The DGS-3630 Series Gigabit L3 Stackable Managed Switches are designed for Small to Medium-sized Businesses (SMBs), Small to Medium-sized Enterprises (SMEs), large enterprises, and Internet Service Providers (ISPs). They deliver high performance, flexibility, fault tolerance, and advanced software features for maximum return on investment. With Gigabit Ethernet, SFP, 10 GbE SFP+, security features, and advanced Quality of Service (QoS), the DGS-3630 Series can act as core, distribution or access layer switches. High port densities, switch stacking, and easy management make the DGS-3630 Series suitable for a variety of applications.. The Enhanced Image supports all the features of the Standard Image in addition to full L3 routing for enterprise integration, including OSPF, BGP, VRF-Lite and L3 multicast. The MPLS Image offers all the features of the Standard and Enhanced Images in addition to VPN services for ISPs, including IS-IS and MPLS L2/L3 VPN. With multiple software images, only the required features need to be installed, providing a flexible approach to software management. 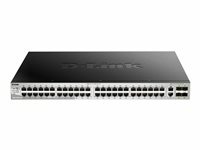 The DGS-3630-28SC switch has 20 gigabit SFP Ports, 4 Combo SFP Ports and 4 10G uplink/stacking ports. The Enhanced Image supports all the features of the Standard Image in addition to full L3 routing for enterprise integration, including OSPF, BGP, VRF-Lite and L3 multicast. The MPLS Image offers all the features of the Standard and Enhanced Images in addition to VPN services for ISPs, including IS-IS and MPLS L2/L3 VPN. With multiple software images, only the required features need to be installed, providing a flexible approach to software management. The DGS-3630-28TC switch has 20 x 10/100/1000BASE-T ports, 4 Combo SFP Ports and 4 10G uplink/stacking ports. The Enhanced Image supports all the features of the Standard Image in addition to full L3 routing for enterprise integration, including OSPF, BGP, VRF-Lite and L3 multicast. The MPLS Image offers all the features of the Standard and Enhanced Images in addition to VPN services for ISPs, including IS-IS and MPLS L2/L3 VPN. With multiple software images, only the required features need to be installed, providing a flexible approach to software management. 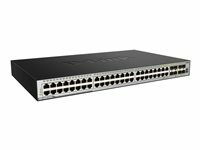 The DGS-3630-28PC switch has 20 gigabit PoE+ Ports, 4 Combo SFP Ports and 4 10G uplink/stacking ports. Power over Ethernet, which allows PoE-powered devices to be powered by the switch through a standard Ethernet cable. The DGS-3630-28PC features Power over Ethernet, which allows PoE-powered devices to be powered by the switch through a standard Ethernet cable. It supports the IEEE 802.3af PoE and IEEE 802.3at PoE+ standards, providing up to 30 W of power per port. PoE effectively reduces deployment time for PoE devices such as IP cameras, VoIP phones, and access points, and eliminates the cost for additional electrical cabling. It features a 370 W PoE power budget which can be increased to 740 W when outfitted with the DPS-700 redundant power supply, allowing the switches to power even more devices. Additionally, an extended Link Layer Discovery Protocol (LLDP) automatically negotiates and manages the power feed to IEEE 802.3at PoE+ powered devices for optimal power distribution. The Enhanced Image supports all the features of the Standard Image in addition to full L3 routing for enterprise integration, including OSPF, BGP, VRF-Lite and L3 multicast. The MPLS Image offers all the features of the Standard and Enhanced Images in addition to VPN services for ISPs, including IS-IS and MPLS L2/L3 VPN. With multiple software images, only the required features need to be installed, providing a flexible approach to software management. The DGS-3630-52PC switch has 44 gigabit PoE+ Ports, 4 Combo SFP Ports and 4 10G uplink/stacking ports. The DGS-3630-52PC features Power over Ethernet, which allows PoE-powered devices to be powered by the switch through a standard Ethernet cable. It supports the IEEE 802.3af PoE and IEEE 802.3at PoE+ standards, providing up to 30 W of power per port. PoE effectively reduces deployment time for PoE devices such as IP cameras, VoIP phones, and access points, and eliminates the cost for additional electrical cabling. It features a 370 W PoE power budget which can be increased to 740 W when outfitted with the DPS-700 redundant power supply, allowing the switches to power even more devices. Additionally, an extended Link Layer Discovery Protocol (LLDP) automatically negotiates and manages the power feed to IEEE 802.3at PoE+ powered devices for optimal power distribution.